In the early days of aikido, when the cup is well and truly empty, it’s pretty easy to make progress just by turning up and soaking up information like a sponge. The learning pedagogy follows the learning pyramid down a few levels and by green belt you’re confident and by brown belt a little cocky. By shodan there is usually a confrontation with self as you probably don’t measure up to your own preconception of “black belt” awesomeness, and by the time you exit sandan there’s a faint sense of disquiet creeping into your soul as you have run out of things to do. It is here that the other aspects of aikido take on a greater role. Rather than a perfunctory practice that seems culturally appropriate, such as mindfulness meditation and breathing or finding the stillness of yoningake, students might be asking, “Where to now?”. In a previous blog we looked at pedagogy and it is timely perhaps to revisit that. We can ask ourselves, “What are the mindfulness practices we see in other spheres of education?” whether in vocational training or preparation of athletes. There are significant areas of overlap with traditional study of aikido in honing skills and bringing a maturity to our learning. 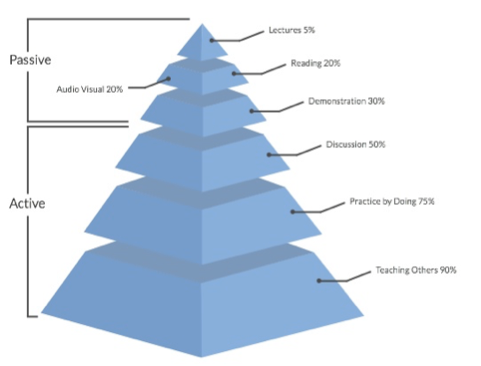 They also start to bring us to the lower levels of the learning pyramid. Weapons were banned from Aikikai Hombu by O-sensei and since that time the role of weapons in understanding the art of aikido has been much diminished. In addition, Kisshomaru Ueshiba and Koichi Tohei oversaw an increasing and ongoing de-emphasis of atemi in aikido. There are historic reasons for these choices which are completely understandable, but they do leave some modern aikido with a few gaps. The roots of aikido are in Daito Ryu. Open hand movements are based on the sword so you don’t need to learn a separate art (and a heap of new motor skills) for when you don’t have a sword. Training with weapons takes us back to the source and improves our aikido. Weapons are a natural tool to extend our mind outside the body. Yes, we know Ki is infinite, but putting a solid lump of wood in your hands gives you direct experience of extending beyond your own body. You can practise on your own. Most aikido arts are paired rather than solo. So unless you can get to a dojo seven times a week, you need to find a way to do more practice: so go scare your neighbours and swing a sword about. Weapon taking (bokken, jo, tanto dori) can take your art to the next level. If your kata practise is losing its edge, putting a weapon in uke’s hand can bring it back to life. Lipstick up a tanto and see how well you can apply principles without getting lipstick all over your gi. Weapon throwing (jo, bokken nage): kata don’t change because you’re armed. If you find yourself wanting to do something different because you have a weapon in your hand, here is a great opportunity to rediscover the kata. Jo nage is pretty mainstream but the lesser known bokken nage is a very powerful and practical tool. Stress inoculation and physiological changes: one of the most important tools for ongoing improvement is to introduce variability and stress inoculation through inducing a manageable, increasing amount of stress. Weapons are great for this. Why not let uke attack any way they want with a knife? Improved coordination, awareness and posture: it’s challenging to perform complex motor skills with a live weapon and not accidentally cut bits off yourself. It’s also interesting to observe how we (unnecessarily) change the way we move due to the distraction of having a weapon in our hands. I am looking forward to the weapons part of atemi jutsu at our Autumn 2017 Workshop to bring some of these aspects to life and see how my kata stacks up! Not just a provocative title, but an excellent starting point from which to develop a better understanding of the art of aikido, and how we might improve its effectiveness in our regular practice. Rather than respond with some variation of “your aikido might not work, my aikido works just fine”, if we want to challenge this assertion, we need only look around the internet forums, or pop into a local MMA gym… you’re likely to be in for a rude surprise if you think you can pull off a sankyo the way you practise it in the dojo. So to be clear, aikido absolutely does work, but aikido techniques as typically practised in the dojo absolutely don’t work in real-life application. The trouble is that techniques are presented (in most dojos at least) as if they are scenario-based, appropriate responses to specific stimuli (such as a particular attack). But this is a complete misunderstanding of the purpose of waza (technique; art; skill). The techniques of aikido are kata (model; form): that is, a standard series of movements chained together for the purpose of principle-based learning and transmission of an art. We learn kata from day one, but the hiden (secret teachings) are in how we interpret or apply them (the bunkai). If you pop along to a sword school or karate dojo it’s a lot more obvious: you’ll likely see their kata being practised as a long series of 30-odd movements. No one in these dojos imagines that in a combat situation they might perform a 30-step kata and have success, instead they might spontaneously apply one or two movements from a kata in a real-life confrontation. So how do we get it so wrong in so many aikido dojos? Perhaps because the kata are so much shorter, it’s possible to mistake them for some kind of preparation for actual combat. And because most of us in aikido are into peace, love and mung beans, we might not look deep enough to discover that any action that relies on reacting to what someone else does is ineffective in real-life violence. People learn through story telling and therefore kata (especially short kata) are often interpreted as a problem with a corresponding series of movements to solve it. This approach helps tap into imagination and thus is a very effective way to transmit and preserve the principles of an art through the generations. In this way the kata of aikido are a kind of container or jar for the art itself and it’s our job to fill that jar with meaning. O-Sensei, the founder of aikido (or some might say Daito Ryu Aiki Jujitsu rebadged for a post-war, right-wing peace movement), said that the way of aiki is formless and spontaneous. From this viewpoint, kata are simply examples strung together to help us study principles. But if we want to manifest aiki we need to move beyond this. So what’s in an aikido kata? Can we pick it apart to enhance our understanding? There are a number of phases including: initial contact, opportunities for striking, the meeting and joining of ki, and resolution through throws and pins. In the contact phase we practise from a diverse catalogue of striking and holding attacks that come from different heights, directions and angles. At the point of contact we apply balance breaking (kuzushi) which needs to be maintained throughout the kata. As we move through the kata we are constantly aware of body positioning (tai sabaki) exploring where we can safely be in relation to uke (omote, ura, shikaku). We learn how to move around our partner safely using irimi and tenkan. There are opportunities for strikes (atemi jutsu), joint entanglements (and breaks — although Aikido™ finds this a little distasteful). The end of the kata explores a feast of projections and pins to keep us entertained for years. The ability to apply what we learn from kata — using the principles in the real world — means picking apart the kata to find each of these elements. This is very different from thinking “Oh, attack x is coming, I need to react with technique y… Damn! Uke didn’t attack correctly… Bad uke!”. Most of us are very familiar with the flowing nature and beauty of kata practise in the dojo. When we combine this with rigorous enquiry into the component elements and phases, we can transform the container of kata into something quite amazing. Another great tool for exploring kata is atemi. O-Sensei is famously quoted as saying aikido is 90% atemi (although he is also quoted as saying 70%). And there’s very good reason for this. It’s not that we want to go around hitting people, we probably wouldn’t have chosen aikido if we did! It’s that atemi is a terrific tool for understanding our aikido kata. Atemi not only makes our flowing, dojo aikido better but also gives us a way to apply the principles we learn in kata in a devastatingly effective way when necessary. A few years ago, through the experiences shared by fellow argonaut Andrew Sunter, I was introduced to Target Focus Training (TFT), a modern combative art that has evolved from investigating the best way to train special forces in the US. It’s not my cup of tea, but it very simply and effectively puts into perspective the role of atemi jutsu in aikido. Andrew continues to study TFT and integrate the principles of atemi jutsu into Great Ocean Aikido. remove hesitation and therefore develop better flow. I am looking forward to learning more as we catch up at our Autumn workshop in Alstonville using Jim’s engaging style of learning to accelerate understanding. I hope to see friends there from near and far.